There are two big problems in the world of media. The first problem is that media companies look at the internet as a "secondary" income stream, and, therefor, price their products too low. The second problem is that, because they see it as a secondary income stream, they don't give people a real reason, or even the right conditions, to shift from the old to the new. That means that people see these new channels as an accessory to the old rather than a real alternative. This is happening in all the digital content markets. Books, games, music and movies. But the area in which this is most clear, is in the TV industry. We all know what the future of TV is going to be like. Instead of buying a package of random content where the content providers decide what shows to air and when you can watch them, we now demand to get access to everything so that we, the viewers, can decide what we specifically want to see at any given moment. The era of the TV Guide, where you would browse through the channels to see when something good is on, is over. In the future, you simply decide what we want to see, when you want to see it, and even how you want to see it. We could do this today - if the TV studios would just allow it. But the question is, how much would people be willing to pay for the new world? A new world that is providing you with the same content as before, just in a far more convenient and controllable way? The answer is obvious; People are willing to pay the same amount of money as they are already spending on cable TV today. People always say they want to pay less, but when it comes down to it, people are willing to pay the same amount of money as they have always done - otherwise they would have stopped paying a long time ago. So, why is Hulu Plus or Netflix only $7.99, when it should be the $130 that people pay for Cable TV? It makes no sense. 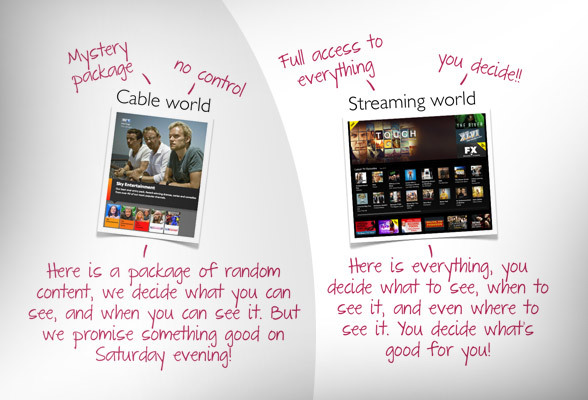 You get more than before, you have full control over the content, you decide what to watch and when to watch it. Why is that worth less than before? The answer is that services like Netflix isn't the new world. It is being limited and restricted by the TV studios. Netflix is being hampered by content licensing deals that both restrict what they can offer in each country, and what they can offer as a whole. We are not getting "full access". TV Studios are restricting distribution and adding delays. Like when BBC is imposing a six month delay, or when Warner Brothers adds limitations to not just when you can watch something, but even when you can add it to you queue. Netflix deal with Warner Bros. includes delay in queues. Under a new deal between the two companies, Netflix users won't just have to wait 56 days to rent Warner Bros. movies on DVD. They'll have to wait 28 days to add the movies to their queues. With those kinds of restrictions, people will never pay the same for Netflix as they do for cable TV. You not getting the same product. Netflix is being reduced to this half-baked puddle of goo. It looks like the new world, but the TV industry hasn't changed anything yet. As long as the new world is being restricted, only a very small percentage of people will decide to "cut the cord". Instead, many people will pay for both. Take the example of Sky Cable TV (UK) + Netflix (UK). In the past, everyone was using cable. But now, with the introduction of Netflix in the UK, perhaps 10% will choose to subscribe to both. If you are a TV executive, this is an amazing development. People are paying twice for the same content. In 2015, things will go even better. 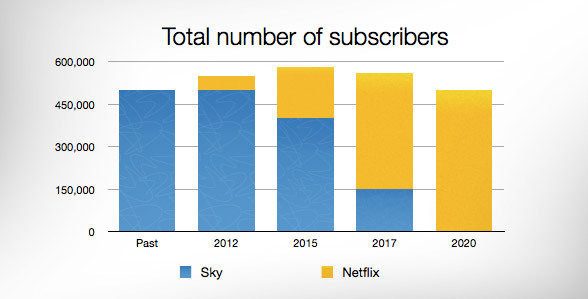 Even though about 20% have now "cut the cord" and even larger percentage is now paying for both Sky Cable and Netflix. In 2017, 350,000 people will have shifted to streaming TV only, and things are starting to slow down. And finally in 2020, everyone will have shifted from the traditional cable TV world to the new streaming TV world. When you see a graph like the one above the shift itself looks pretty good, and the tactics of delaying the shift seems to be encouraging people to pay twice for the same content. But this is only half the story. If we instead look at the same numbers but from a total revenue perspective, you see a very different picture. In 2012, things are going well as some are paying for both services. 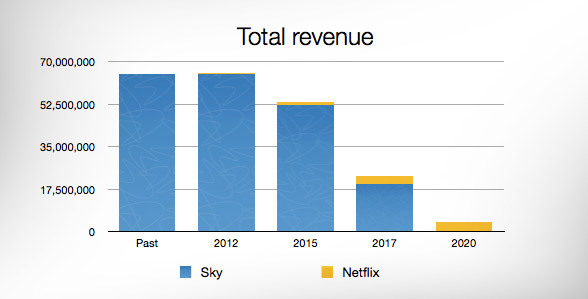 And while Netflix only amounts to a tiny increase in revenue, the graph is going up. But then, in 2015 and onwards, things start to go horribly wrong. The problem is that one cable TV subscriber pays $130 while a Netflix subscriber only pays $7.99 - meaning that for every cable TV subscriber that "cut the cord" Netflix needs to get 16 new subscribers, and that simply isn't happening. When we finally reach 2020, even though the TV industry reaches the same amount of total subscribers as before, the revenue has dropped by a staggering 94% - and that is *game over*. No industry can survive such a dramatic drop in revenue. The TV industry is simply committing suicide. By hampering and restricting the new world, the TV industry is telling people that the digital world is worth less - and thus should be priced at much lower rate. But that isn't going to stop the world from changing. People will shift from traditional cable TV to the digital streaming world. And by delaying the shift from happening, they are completely destroying their own future revenue. You never want to teach people that the new world is worth "less than before" - especially not when the new world is worth more, if done right!! And remember, this is not just happening to the TV industry. The newspaper industry is already close to the 2017 point in the graph. People are now dominantly consuming news online, but they also refuse to pay for it as the industry taught them not to. It is the same with the music industry. Spotify might sounds like a great idea, but the revenue payout is miniscule. The book industry is somewhere around the 2015 point. It's slightly different because you don't buy "packages of books". But the book industry is making the same mistakes - limiting books to single devices and platforms, adding geographic restrictions, insisting on licensing etc - all causing ebooks to drop in price. The movie industry is not far behind and it, in many ways, follow TV's future. The gaming world is just starting to get into trouble. On the XBOX, new games are not sold "on demand" until well after they have been released on traditional channels - and thus at a lower price. The content world's insistence of saving the past by devaluating the new might seem like a good idea in the short run, but it is the absolute worst thing anyone can ever do. If you want to create a future of content, in which people are willing to pay full price, you need to fully embrace the new world from the start. The TV industry needs to stop living in a one-way broadcast world, and fully engage in a two-way connected world. That means no licensing agreements but instead a direct connection. It means no restrictions or delays that devaluate the new. And it means giving people everything and then let them decide what they want instead of packaging it into predefined boxes. We cannot stop the world from changing, but we can stop making the new world 16 times less valuable than the old. It is the only way to win!